In today’s Kitsap Sun, we ran a roundup of top stories on the education beat for 2016. Teachers’ walkouts, McCleary madness, the Kennedy flap over school prayer, the end of No Child Left Behind … It was a whirlwind year. Not all the education news coming out of Kitsap County was serious, however. Here are a few of the stories that still make me smile. 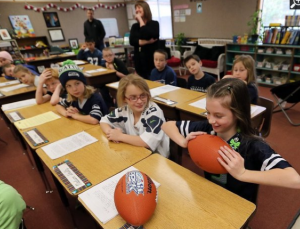 In late January, a fourth-grade class at Mullenix Ridge Elementary in South Kitsap decided to do their own scientific investigation of De-flategate, the uproar over allegations the New England Patriots weaseled their way into the Super Bowl using underinflated balls in the AFC championship game. Ashton Smith, the lone Patriots fan in the class, defended quarterback Tom Brady, but quickly became a bitter old man, when NFL Commissioner Roger Goodell upheld a four-game suspension imposed on Brady for his part in the scandal. A federal court later tossed the suspension, for lack of due process in the investigation. In February, acting students at South Kitsap High School made a regional ripple on social media with the hashtag #SKvsFallon. The students and their coach Scott Yingling issued a video challenge to late night host Jimmy Fallon for an “Improv-off.” The video racked up 30,000 views shortly after it posted and SKvsFallon was briefly a trending topic on Facebook in Western states. In March, Brownsville Elementary School Principal Toby Tebo kissed a goat for a school fundraiser. “Kissing goats, it’s a good idea. It’s going to be fun, and I can’t wait to pucker up,” Tebo said, before giving Peanut the pygmy goat 21 kisses, one for each goat the students sponsored for an African village. In December, we asked students at Pearson and Vinland Elementary schools what advice they’d give Santa. Here’s Rachel Seymour’s video with their response.